SUMMARY: Chattahoochee, Florida, a town with a state mental institution on its main drag, seldom slips from its usual relaxed pace. Everyone here knows everybody else, and senior citizen Elvina Houston, head of the little-ole-lady hotline, keeps her nose wedged in the middle. October typically brings three festivals and a break from summer. But this year, the relentless heat and humidity continue and a parade of horribles cranks up for Jake Witherspoon, his best friend Hattie, and her older brother Bobby, one that will affect their intertwined families, friends, and the entire town. Hattie lives three miles out of town on family land with her husband and adopted Chinese daughter Sarah Chuntian. Sarah is thirteen, barreling into the tumultuous teenage years, and Hattie worries about the dangers she and her husband can’t control, especially online. When Jake receives a series of odd, suggestive text messages, he fears a repeat of the horrible hate crime fifteen years prior, an assault that nearly took his life and left him with a badly maimed leg. Jake’s longtime partner Shug Presley works as a hospice nurse, with long hours and grinding stress. The texts escalate, but Jake doesn’t share his growing sense of dread. Shug tells Jake about an impending visit from his sister Genevieve. A long adversary of Shug and Jake’s homosexual relationship, Shug’s oldest sister had long ago turned the Presley family against him. Instead of offering acceptance, Genevieve reveals plans to enroll Shug in a reprograming camp in Alabama. Jake strives to push down both his anguish for Shug’s sadness and his own mounting anxiety. The incidents Jake perceives as a replay of his assault are every bit as real as the twisted man who inches into Hattie’s family. How this group of small town folk handles the clash with hate and crime is a tribute to resiliency, friendship, and hope. THE BACK STORY: I had long wanted to pen a follow-up to my first novel The Madhatter’s Guide to Chocolate. As an author, I cull story line ideas from my life. In late 2016, I received a series of suggestive text messages, and the numbers grew to the point I counted as many as thirty to forty daily. It took several weeks to unravel the mystery with the help of an officer who specialized in cybercrime. Turns out, someone had listed my cellphone number with an ad on an international website known for prostitution. This made me think: though I viewed the situation as a mystery to be solved, and often hilarious, how would a former victim of a hate crime perceive the same texts? The nature of fear has always intrigued me, both the kind we build in imagination and the tangible threats we often don’t see coming. At the same time I worked to unravel the origin of my text messages, a friend had issues with her teenaged child and a suspected online stalker. The combination of these two spurred the plot line for Parade of Horribles. Small town, close-knit folks, and the bump in the night terrors that threaten to derail life. I actually had the title tucked aside a few weeks before the text messages started. I believe in kismet; my life is full of similar bread trails through the forest. My job is to follow and record. WHY WOULD SOMEONE WANT TO READ IT? I write with humor, alongside the heavy subject matter. 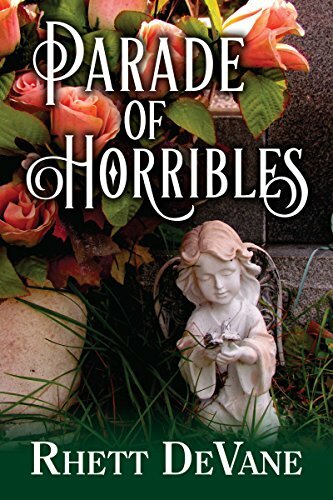 Parade of Horribles addresses PTSD, hate crimes, and the heavy preconceptions that often lead to misunderstandings or worse. The feel of the Deep South comes through, with insights into human behavior. I pen the kind of book I like to read: one with complex characters who rise above the road blocks placed in their paths. I especially enjoy mixing in controversial issues, in hopes that readers might question their own biased beliefs. Plus, I believe in hopeful endings. Not happily-forever-after fairy tales, but stories that give a reader a break from the sometimes unsurmountable horrors we face in these times. described as delicious in its delightful Southernisms, intriguing in its mystery, and moving in its deeper layers, which address themes of social justice…and injustice. Buckle up for ride number seven: Parade of Horribles. “Many Southern authors have laced their fiction – and sometimes creative non-fiction – with Southern expressions, dialect, behavior, and mannerisms. And compared to Rhett DeVane, many have failed. AUTHOR PROFILE: According to my family, I’ve made up stories since I was old enough to talk. Growing up in the country with no close playmates, I invented my own. I vaguely recall a roller skate I turned into a character, and heaven knows, if you were a cat or dog at my house, you wore costumes and took high tea. I can’t remember a time when I didn’t have stories running around in my mind like rednecks at an all-you-can drink keg party. I dabbled with writing in high school and college, but didn’t hunker down to pen a novel until I reached my forties. The Madhatter’s Guide to Chocolate whet my love for fiction and I took off. Since then, I have published a total of seven mainstream fiction novels set in the South: The Madhatter’s Guide to Chocolate, Up the Devil’s Belly, Mama’s Comfort Food, Cathead Crazy, Suicide Supper Club, Secondhand Sister, and Parade of Horribles. I even tried out coauthoring, both a vampire spoof, Evenings on Dark Island with Larry Rock and a political thriller, Accidental Ambition with Senator Robert W. McKnight. Suicide Supper Club received the 2014 President’s Award from the Florida Authors and Publishers Association. In addition, a number of my short stories are included in anthologies in the US and UK. I resist the idea that a writer must drag around a “brand,” producing the same-old-same-old until he or she grows stale. To that end, I stretched my imagination to write middle grade fantasy: Elsbeth and Sim and Dig Within. Seems I always have several projects floating at once. Now, I bounce between Southern fiction, middle grade fiction, and children’s picture book manuscripts. Plus, I’m in the giddy first-draft stage with a young adult fantasy full of dragons and all sorts of creatures. This summer, I plan to release second editions of The Madhatter’s Guide to Chocolate and Up the Devil’s Belly. Both novels were originally published by a small press in Texas and are out of print. Florida’s capital city of Tallahassee has been my home since college graduation. I don’t deny my hometown roots, and Chattahoochee is never far from my heart. Through my words, I hope to convey the reality of the Deep South with its quirky characters, humanity, and of course, food. As a little plus, I include recipes in all of my Southern fiction novels. That has been a huge hit. My other profession—dental hygienist—seems a weird mix to most. I often joke that I work to support my writing habit. After more than forty years, my patients are friends. They listen to me babble about the latest line-up of characters and plots, and line up to buy my books. I can’t imagine life without writing. It comes as naturally as breathing. At times it makes me giddy. At other times, I rant—usually in the revision and rewrite stages. God willing, I will be able to continue as long as I am on this green earth. And if I become posthumously famous, I am going to haunt someone, though I will still be pleased, wherever I end up. A cell phone text alert chimed— to most people, a sound as ordinary as breathing. Jake Witherspoon rested a bouquet of sweetheart roses on his worktable. Had to be his life partner, Jon “Shug” Presley. Few people had his personal cell phone number. Across the room, Jolene Waters, his partner in business, glanced up from a towering pile of invoices. Her fiery hair stuck out in comical tufts. Reminded Jake of a banty rooster. He wiped moisture from his hands onto a Dragonfly Florist apron and picked up the phone. Could be Hattie, but she’d already phoned him this morning and besides, rarely texted. Could be Elvina, with yet another question about the sunroom she was adding onto her house. He picked up the phone. Not Shug’s number. Or Hattie’s. Or Elvina’s. Or anyone in his limited directory list. God knows, Shug would never write you’re incorrectly. Wouldn’t chop words to skeletons either, or stoop to lazy text-English. And jumping Judas on a pogo stick, didn’t anyone use punctuation these days? Couldn’t imagine Elvina Houston calling anyone hot, especially not someone forty years her junior, and gay. Best to stop the idiot on the other side of that babe before they embarrassed themselves for something beyond poor language skills, or heaven forbid, sent some naked selfie. “Wrong number,” he dictated to the device. I think you said wrong number. Is that correct? the female automaton answered. Okay. I’ll send that now. “What’d you say?” Jolene said. “Sorry, hon. Didn’t mean to interrupt you.” He thought about sharing the babe text with her, but she had her paper-pusher face on. Thank God for her. He detested the business end of things. Jolene was such an organization freak, she barely had to break a sweat come tax time. Left to his own, he would sooner pitch the papers into a shoe box and let the accountant sort it out. He laid the phone down on the worktable. No time for some stranger’s tomfoolery. Not with three festivals and the holidays looming. People tended to die around this time of year . . . those casket drapes and funeral sprays. And it wasn’t only the kinfolk of the dearly departed clamoring for his services. Christmas brides with their momzillas demanded attention. And end of year parties? Not complete without flowers. Oh heavens no. Shouldn’t grouse about having a successful business, especially in a place the size of Chattahoochee. A town with two stoplights. And a state mental hospital on the main drag that accounted for the majority of the population. He could be back in New York, living in a cramped one-room. Or in an alley. Or dead. A shadow fell across the flowers on his worktable. Jake froze. He looked toward the front door. A man. A giant. Peering through the glass, his beefy face a black, undefined mass outlined by two large cupped hands. Jake took a couple of steps back, tucked himself behind the threshold leading to the storeroom. “What are you doing?” Jolene asked. Jake looked away from the entrance to Jolene’s desk. She watched him with a combination of you’re on my last nerve and do I need to worry about you? When he shifted his gaze back, the man was gone. “Nothing.” Maybe one day he could spot a stranger and not think he was going to be beaten senseless. He moved to the worktable. Beneath the clump of roses, plumosa fanned out like a verdigris fern spider web. The baby-blanket pink rose petals drew him in. If he could only spare the time, Jake could stare at a single bud until he fell inside it, lost in the intricacy of color and form. Safe. Beauty shifted his thoughts from his overreaction to that large man. And from the pain he lived with— for a moment. His damaged left leg throbbed, a hateful heartbeat. Jake shook it. Sometimes that helped the muscles relax. There should be a phone app for pain management. Those tech geeks had one for everything else. It would come in handy right about now, with PiddieFest weekend coming. Too bad Hattie’s late Aunt Piddie hadn’t lived to witness these new smartphones. It would’ve assisted her with the latest gossip. Of course, Elvina had put one of the first generation cell phones into the casket with Piddie, at the viewing, before Piddie’s earthly body was turned to ash and crumbles of bone. Wonder if that phone got turned to ash as well . . . The phone chimed. Another text. What the hell? He clenched his teeth. Somebody playing a joke? It wasn’t funny. He keyed in the answer this time. No need to really aggravate Jolene. He resumed arranging the roses and plumosa. And ruminating. Floral design came so easy after so many years, his mind could go off on tangents while his hands stayed on task. Where had he been before some weirdo wonted him bad? Ah, yes. Piddie’s ashes. Jake pushed aside the image of those crumbly “cremains”— what a bizarre term. He’d rather remember Piddie Davis Longman as she had been in life: the matriarch with her signature lavender beehive hairdo. That lifted both corners of his lips. Oh, how he wished he could talk, actually talk, to Piddie, hear her voice. Jake snugged flowers into place, spun the dish around. Tilted his head to check for symmetry. So much had changed since his elderly friend left for her “great beyond.” Not just cell phones. Everything nowadays morphed at blue-hot speed. Jake struggled to keep up. Somewhere in the little frame house on Morgan Avenue that Piddie had bequeathed to Jake, a storage box held a growing slush pile of outdated tablets, phones, and laptops. Wouldn’t it be lovely to push delete for that. Except for Shug’s first mobile phone, a flip-top brick that reminded Jake of an overstuffed Star Trek communicator. That one, he’d keep. Note to self: find that box and recycle some of them. When you have time. Right. He turned his head toward the rear of the shop. Could store a box or two back there. Jake reached for another bloom then paused. Perhaps he could slip a few canisters of Shug’s festive decorations into the donation pile, too. “Christmas. Lord help me through it,” Jake mumbled under his breath. “You don’t live with Shug.” Jake took a deep breath, let it out. He stood, arms akimbo, glaring at the floral arrangement as if it were somehow responsible for the eight Christmas trees waiting to take over the house. And that didn’t count the two new ones Shug had bought on closeout, end of last year, one meant to hang upside-down from the ceiling. Except for the soft click of computer keys, the shop grew quiet, until Jolene started to hum. As if she needed encouragement. Jolene was known to hum carols in July. “You used to like Christmas,” she said without looking away from the laptop. Jake shoved a rose into the arrangement so hard the stem bent. “Crap.” This time of year brought out the cussing man in him. He couldn’t tamp down the mounting rant. “Blow-up figurines will wheeze to life on our front lawn. Small wonder we don’t torch a transformer.” He whirled the arrangement, stabbed in another rose. This one didn’t break under pressure. But he might. Like Hattie’s goofy, optimistic self, he adored the fall. Pumpkins, baskets of russet and golden mums, cinnamon-scented everything. Bring them on. Thanksgiving? Also grand, with lavish Southern dishes shared with the people he called his heart-family. Jolene pushed back from the desk and crossed her arms. Elvis, Shug’s Pomeranian, used to eat the dang needles then yak up the sludge later. Jake’s chest felt heavy. God, he’d miss that old dog’s green puke this year. He truly would. “Where would I possibly fit in a vacation?” Oops. That sounded more harsh than he intended. The text alert sounded. Seriously? He snatched up the phone. Jolene groped for the pencil she’d stashed behind one ear. “My, aren’t you Mister Popularity today?” She made check marks on several invoices. Jake slipped the phone into his apron pocket and picked up his pace on the Welcome Baby basket. He filled in the blank spots with fern, and pink and white sweet peas. The sweet peas— real name lathyrus— added for their color and enchanting scent, fresh, but not overpowering. No baby’s breath fronds. So common. He turned to take the finished arrangement to the wheeled delivery cart. The text chime chirped again. He set the basket down, palmed the phone. Another one? His heart fluttered. Different number. Same bad grammar. At least this one had a period at the end, and a capital letter at the start. Jake thumbed in the reply. “People really should double-check before they hit send,” he said. Jake selected a cane from a long line of hooks, one of eight fall-themed walking aides. If he was going to limp the rest of his life, might as well make a fashion statement. Elvina— head of Chattahoochee’s little-ole-lady hotline and the social engine of the Triple C Day Spa and Salon— had this one created especially for him. Carved wooden handle, fall leaves shellacked onto the shaft. Tacky enough to charm. Sturdy enough to help him balance. Since the hate crime that had nearly cost Jake his life, he had amassed two hundred and twenty-eight walking canes, if Hattie’s last tally could be trusted. Sister-girl tended to exaggerate. She was one to talk, with her fifty million refrigerator magnets. And those rocks both she and her sister collected. Should get rid of some of his canes, but couldn’t. Each reminded him of a few more steps away from that horrible night in ’99. The night two teenaged cousins, Marshall and Matthew Thurgood, wrecked this shop. Then one of them wrecked him. “Get past the redneck bluster, and he’s not a bad sort.” Besides, I adore Hattie and her family, so Bobby comes with the package. Jolene tapped figures into the laptop. “Want something from Mary-E’s while I’m out?” he asked. Hattie and Bobby’s middle sister Mary-Esther owned and operated the Wild Rose Diner a couple of blocks down. “Okay, Joe-gee. Ding me if you change your mind.” Jake pushed the cart toward the back door. The phone chimed. Jake paused by the rear entrance, at the same spot where his blood had pooled that awful evening over fifteen years ago, painted over when Hattie and a handful of his townspeople had cleaned and repaired the damage to his West Washington Street shop. This time, the downy fuzz on his nape prickled when he read the words. LOCAL OUTLETS: In Tallahassee, my novels are available at My Favorite Books on Market Street.